Pavlov's House became the name of a fortified apartment building during the Battle of Stalingrad from 27 September, 1942 to February 2, 1943. It gained its popular name from Sergeant Yakov Pavlov, who commanded the platoon that seized the building and defended it during the long battle. The house was a four-story building in the center of Stalingrad, built parallel to the embankment of the river Volga and overseeing the "9th January Square", a large square named for Bloody Sunday. In September 1942, the house was attacked by German soldiers, and a platoon of the Soviet 13th Guards Rifle Division was ordered to seize and defend it. The platoon was led by Junior Sgt. Yakov Pavlov, a low-level noncommissioned officer serving as acting platoon commander since the unit's lieutenant and senior sergeants had all been wounded or killed. The attack on the building was successful, although the fighting was brutal, with only four men in the 30-man platoon surviving the assault. The strategic benefit of the house was its position on a cross-street giving the defenders a 1 km line of sight to the north, south and west. After several days, reinforcements and resupply arrived for Pavlov's men, bringing the unit up to a 25-man understrength platoon and equipping the defenders with machine guns, anti-tank rifles, and mortars. In keeping with Stalin's Order No. 227 - "not one step back", Sgt. Pavlov was ordered to fortify the building and defend it to the last bullet and the last man. Taking this advice to heart, Pavlov ordered the building to be surrounded with four layers of barbed wire and minefields, and set up machine-gun posts in every available window facing the square. In the early stages of the defense, Pavlov discovered that a PTRS-41 anti-tank rifle he had mounted on the roof was particularly effective when used to ambush unsuspecting German tanks; once the tanks had approached to within 25 meters of the building, their thin turret-roof armor became exposed to AT rifle fire from above, but they were unable to elevate their weapons enough to retaliate. Pavlov had reportedly destroyed nearly a dozen tanks personally using this tactic. For better internal communication, they breached the walls in the basement and upper floors, and dug a communications trench to Soviet positions outside. Supplies were brought in via the trench or by boats crossing the river, defying German air raids and shelling. Nevertheless, food and especially water was in short supply. Lacking beds, the soldiers tried to sleep on insulation wool torn off pipes, yet usually the Germans kept shooting at the house with deafening machine-gun fire day and night. Eventually the defenders, as well as the Soviet civilians who kept living in the basement all that time, held out during intensive fighting from 23 September until 25 November 1942, when they were relieved by the counter-attacking Soviet forces. Pavlov's House became a symbol of the stubborn resistance of the Soviet Union in the Battle of Stalingrad, and in the Great Patriotic War in general. It stands out prominently because the German armies had previously conquered cities and entire countries within weeks; yet they were unable to capture a single half-ruined house, defended most of the time by just over a dozen soldiers, in spite of trying for two months. It is reported that the building at the "9th January Square" was marked as a fortress in German maps. 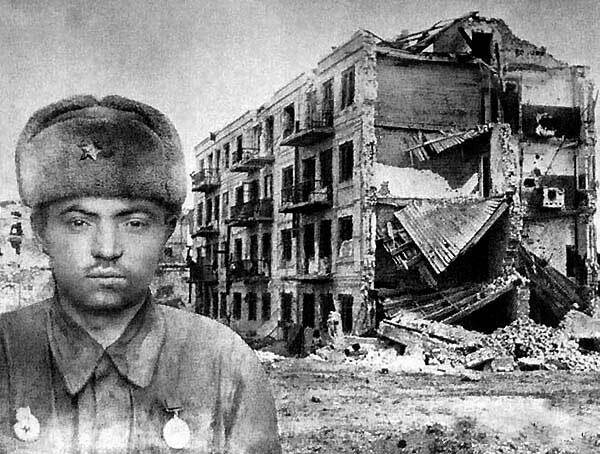 Vasily Chuikov, commanding general of the Soviet forces in Stalingrad, later bragged that the Germans lost more men trying to take Pavlov's house than they did taking Paris. Pavlov's "House" was rebuilt after the battle and is still used as an apartment building today. 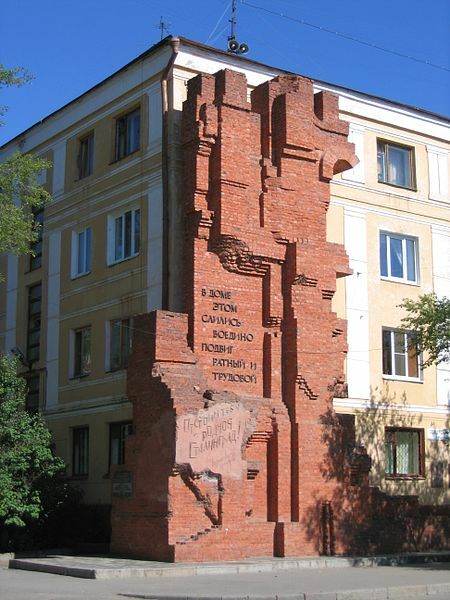 There is an attached memorial constructed from bricks picked up after the battle on the East side facing the Volga. Pavlov was awarded the title Hero of the Soviet Union for his actions. Pavlov was born 1917, drafted into Red Army 1938 (artillery?). The next we know he is part of Rodimtsev's 13th. Guards in Stalingrad. Badly wounded in the defence of "his" house he was hospitalised for a time. Made lieutenant in 1944, re-joined 13th. (now 8th.) Guards. Made senior lieutenant & participated in taking of Berlin. Komsomol member, KPSS member in 1944, Hero of Soviet Union in 1945. Yacob Pavlov later became the Archimantdrite Kyrill in the monastary at Sergievo, formerly Zagorsk, where he attracked a huge following of the faithfull that had nothing to do with his fame from Stalingrad. He died 1981. Map and list of the defenders of Pavlov's House who participated in it's defense from 26 September 1942 till 25 November 1942. Map of the house and a list of the defenders of Pavlov's House.